Preparing for an interview is important if you are involved in a job search; you want to show the hiring manager you care about the position and have done your due diligence. Sometimes, however, you forget to do things like research the company or you neglect to bring your resume, reference list or other important materials when you're running out the door to get to your interview on time. There is always a chance the hiring manager will not know you came unprepared. But, if you let your lack of preparation make you flustered and anxious, you aren't going to perform well in any part of your interview. Before you walk in the door, focus on what is important: selling yourself. Remind yourself that forgetting to do one or two things doesn't have to make or break your interview, and stay calm and collected so you can impress the hiring manager so much that your lack of preparation in an area won't matter. Move forward past difficult questions. If you're asked a question you aren't prepared for or asked to provide your documents and you don't have them, don't spend a long time making excuses and fumbling for an explanation. Answer briefly and simply: “Can I think on that more and provide you an answer later,” or “Can I email my reference list to you later, I don't have it with me today.” Then, move on to the next question so you don't dwell on the lapse. 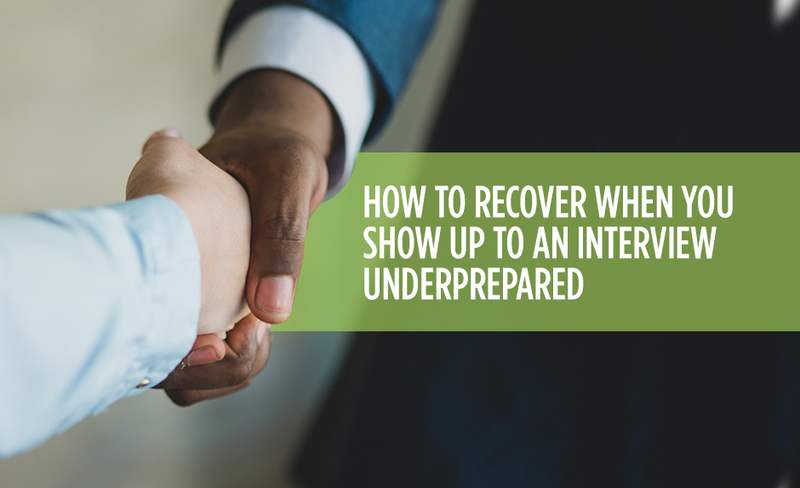 Learn from the experience to better prepare for your next interview. If you find yourself frustrated by not being prepared and you end up not getting the job, don't let the setback derail your job search efforts. Just make sure you don't make the same mistake again by making a checklist of things to do to prepare before your next big interview. Eastridge Workforce Solutions can help you land interviews with companies you will be happy to work with. Contact us today and let our staffing service help you get your foot in the door so you can get an interview that you'll be so excited about, you'll be ready to impress the hiring manager into allowing you to join their team!